The most disturbing information in the new report is the prediction that 24 million Americans will lose health insurance by 2026. That high number reinforces our tentative estimate that at least 1.1 million Pennsylvanians, and probably more, will lose health care coverage when the AHCA goes fully into effect. It also lends support to our view that 4,000 Pennsylvanians will die prematurely because a lack of insurance will make it impossible for them to get the health care they need. In Philadelphia, a 60 year old with an income of $40,000 will see a decline in their tax credit from $8,470 to $4,000. In Centre County, a 60 year old with an income of $40,000 will see their tax credit decline form $10,700 to $4,000. Finally, the CBO predicts that, once the incentives in the ACA for businesses to insure their employers are eliminated, seven million people who now get employer-based insurance in the country will lose it. This will be especially problematic in Pennsylvania, which has the 9th highest rate of employer-based insurance of all 50 states. 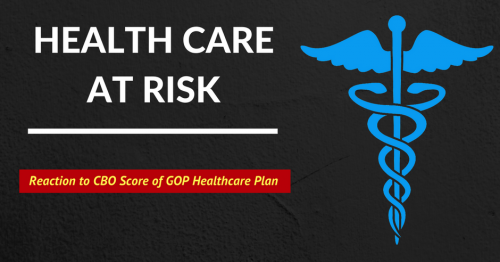 Our rough estimate is that 300,000 people will lose employer based insurance in our state.